More and more, I’m hearing my women friends – many of them mothers, but not all – complain about fatigue, insomnia, anxiety, chronic pain or stress-related health issues. Not surprisingly, many of the women who see me for Reiki treatment or wellness coaching report list those as reasons for their visit as well. The demands of modern society are relentless, and the environmental toxins we are continually exposed to upset our complex, fragile endocrine systems. Yet, the image of “Superwoman” is one we are somehow conditioned to believe we should emulate. You know who I mean: the woman we idolize who successfully manages a career and/or a household, a social life and possibly some volunteer activities with seemingly little effort. And of course she’d never be caught dead with bedhead and wearing sweatpants while in line at the grocery store. We think some other person is “Superwoman” as we slog along, powered by caffeine and adrenaline, desperately trying not to collapse as we multitask our way through the day. But the truth is, on some level, nearly all of us are “Superwomen” because society expects that of us, and we expect that of ourselves too. I can’t tell you how many times I’ve seen status updates on Facebook or tweets where women I know list all of the tasks they’ve completed – or need to complete – that day as if it’s a badge of honor. (I rarely, if ever, see men do this.) Some of us accomplish this ridiculous task overload wearing sweatpants too, because as we know, there’s no time to put on the cape. The one thing that many women do not prioritize when they are powering through their task list is self-care. And the end result is that they can’t sleep at night or suffer crippling panic attacks. They’re exhausted from lack of sleep, from not stopping, and the combination causes weight gain, chronic pain or flare up of other symptoms. They get sick and stay sick. And how do I know this? Because I’ve been there far too many times. I lived with chronic pain from several different health issues for over a decade before finally learning self-care practices and committing to regular wellness care. I still have to remind myself to slow down and prioritize what is truly necessary or what is an expectation or obligation I’ve placed on myself that I can let go of momentarily or for good. I used to travel a lot for business, and sat through countless iterations of the pre-flight safety instructions. 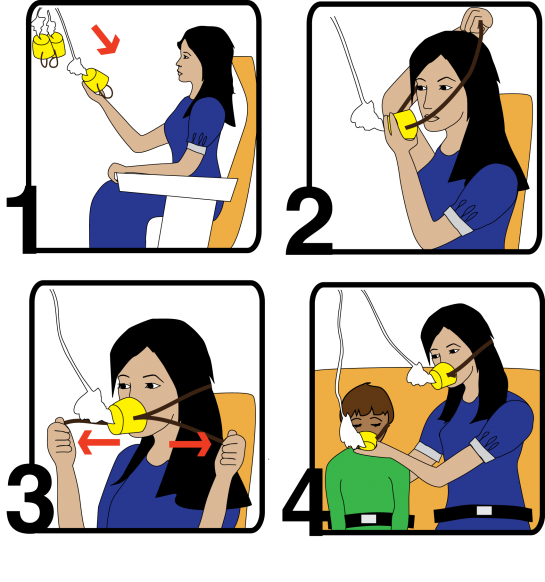 We really don’t like to think about the possibility of having to pull down the oxygen masks in case of an emergency, but the metaphor is a good one. Those of us who routinely care for others – whether it is a team or group of employees at work, patients, our children, or aging parents – need to put the oxygen masks on ourselves first before taking care of another person’s well-being. If we’re constantly gasping for air, how can we be of service to anyone else? Sometimes we pull down the oxygen mask for a few whiffs of air to stay balanced and alert. And sometimes we pull down the oxygen mask to save our lives before it is too late. Tags: health, self-care, stress, wellness, women's health, work/life balance. Bookmark the permalink. Self care is vital. If we are constantly giving, giving, giving – we will deplete the well. Your advice is so sound! Thanks! I find I have to remind myself of it too. So easy to deplete the well when we get caught up in daily life, isn’t it? Exactly. If my cup isn’t already overflowing I don’t have anything extra to give. And only I can keep my cup full. Excellent post Dana…and so true. How true this is. I too look at those “Superwomen” in my life, and never make the connection that it’s a lie. I shouldn’t strive to be someone constantly in panic mode with a million things to do. Instead, I should focus on everything that matters to me… and put myself first instead of last. Thanks for the reminder. omigoodness so true! I have so many friends that are mom’s and put everyone but themselves first and it drives me CRAZY. I take time for myself all the time. Friends think i’m selfish….. but yet i’m the one who’s not chronically sick all winter or is falling behind on getting things done because of fatigue!! GREAT post!! It’s not selfish at all. Depleting ourselves in order to serve everyone else’s needs (or the believe we have that we should be doing it all) can cause chronic illness or acute conditions. Then, not only are we unable to enjoy true health and quality of life, we then place the burden of our ongoing care onto others. Good for you for taking care of yourself! Totally with you on this.. use this metaphor with my clients also.. can’t give to others unless we are filled up and balanced ourselves. Never a big fan of Superwoman or multitasking myself.. it’s craziness.. Rhetorical question: Why IS it that we think of ourselves last? I’ve even noticed that I can be so tired and weary on occasion and it still does not occur to me to give to me….and then it takes longer because I am so depleted. Perhaps on some level, we don’t believe we deserve the same love, effort and attention we give others? Or that it is our responsibility to hold it all together for everyone else? My husband tells me, “Let others take up the slack” but so often, they don’t. At some point, I guess we have to let it go and trust that the truly important work will get done. Completely agree with you. The same goes for love, in order to be able to love somebody else and share the love, we need to love ourselves first. I love this Dana-I tell the same thing to many of my clients, and yes, most of them are moms-taking care of yourself ensures you can care for others, end of story! The oxygen mask is the perfect analogy. I work full time, run a Wiccan Coven of 20 members, and organize events for a community of 100+, plus my long distance relationship, and my own research projects and Tarot business. I don’t consider being over committed as a badge of honor as much as I do a mark of possible insanity! I am on a mission to streamline, narrow, and reduce the number of things I have on my plate. My boyfriend is a wonderful anchor and reminder of this for me. Getting better all the time, but this article reminds me that maybe it’s not just a problem that *I* have, but a problem being forced on women in general.